A long time ago, in a galaxy far far away About 14 years ago, as a uni student, I got a part time job in a costume jewellery shop. It was a tiny store, owned and run by one woman. It stocked costume jewellery, bags and shoes made from matching leather, hats, and gloves. Basically everything you needed for a bridal party, mother of the bride, school ball, or other fancy schmancy event. Or you know, for fun. Although some of the costume jewellery was bought from wholesalers, some of it was designed and made by the owner. I worked one and a half days a week, sole charge, and on those days one of my jobs became to make replacements for any jewellery sold during the week. The owner would leave me with a box of supplies and her design specs, and in between customers I would make jewellery. This was where I learned the basics of jewellery making, skills I still use! Eventually, the owner decided to close the store. It came up in conversation with the owner that she had heaps of old supplies she’d inherited from the previous owner and had never sorted or used and she was going to give them away. I pounced – perhaps I could have some? She said yes! Being a destitute and now unemployed student, my aunt agreed to be my cargo driver, so we bowled up to the owner’s house together. There was a room haphazardly carpeted with over a dozen huge boxes of supplies, all jumbled up, no sense or structure or even labels. We didn’t have time for a through investigation so my method was simple: glance in the box; if the box looked more than half interesting take it; if it looked less than half interesting, leave it. In amongst all the supplies there was one thing that kept catching my eye. 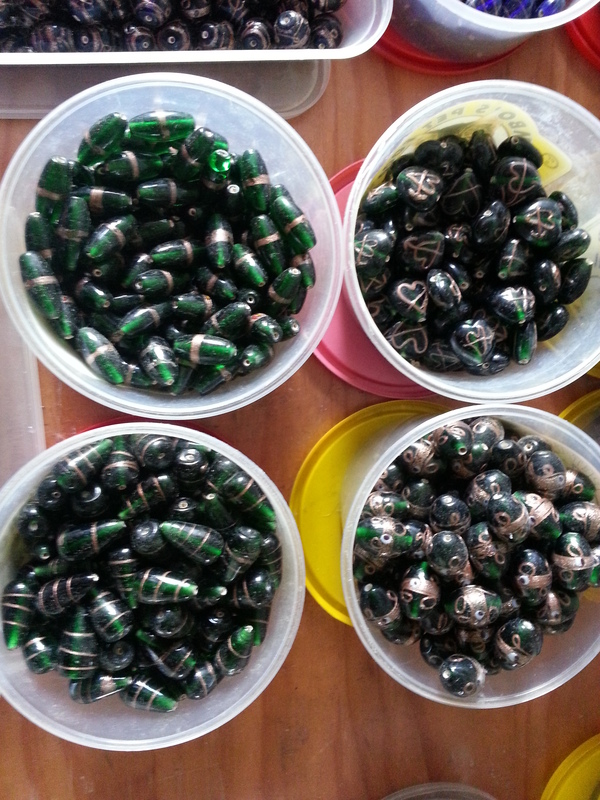 There were dozens of small plastic containers laden with hand painted glass beads. They looked liked lollies and were just as enticing. I had to have them ALL. I’d open a box and see them and claim the box. My aunt would say “but you’ve got those” and I’d point out that these ones were DIFFERENT. Beads like lollies! There were black ones and blue ones and green ones and red ones and purple ones, in lots of shapes like teardrops and eggs and hearts, and they were all hand-painted with gold swirls and little jewel-like drops of colour. I loved them. Eventually we exchausted our stamina (and more constraining, my aunt’s boot space) and we left. I had claimed 9 banana boxes of supplies. Now, in fabric that might not be much – but this was jewellery supplies. Tiny tiny things. So imagine how many supplies were in those 9 boxes! The boxes went into storage for a couple of years while I moved around, but once I settled I dug them out and started the laborious process of sorting the contents. Like went with like: beads with beads, chains with chains, clasps with clasps, etc. 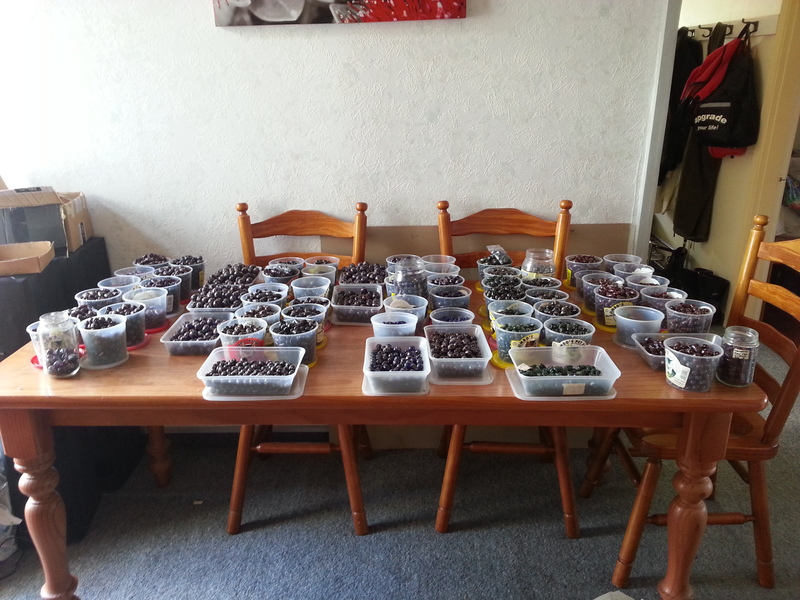 Then I sorted inside each of those categories, by colour or type or similar. This significantly reduced the amount of space it all took up (as I threw out bags and bags of snaplock bags that weren’t needed), got me familiar with my haul, and appealed to my ‘must-organise-all-the-things brain. As I did this, I grouped the plastic containers of glassy lollie goodness together. And eventually discovered I had over 60 of these plastic pots, each with a different design of bead in it. It was, to use a technical term, LOTS. How they were stored. There are more in the drawers and those are more underneath too. I was a little overwhelmed by the quantity. I could never make enough jewellery to use them all. And they hadn’t been cleaned, meaning the holes were filled with glass dust and using them required cleaning the holes out first. So although I made one or two pieces I mostly just moved them around the house over and over again trying to make them take up less space then they did without the use of a TARDIS, with limited success. Eventually I realised my tastes had changed and I was no longer drawn to these beads – and even if I made them all into jewellery I could never sell it all, so l decided to sell the beads. I sold them at markets. I sold them on TradeMe. I sold and I sold in packets of 10 and 20, and after a while I sat back and realised… I’d barely made a dent. So. Many. Glass. Beads. The beads had stopped being inspirational and exciting and started being a millstone, taking up both physical and mental space in my life. They sapped my creativity, made me feel guilty and uninspired. I had to get rid of them but was out of ideas. Then one day I was reading some unsolicited mail from the Child Cancer Foundation, asking for donations. They told a story of a young child who had undergone so many procedures, and made reference to their Beads of Courage programme, where they give away a bead for every procedure, so that every child has a long strong of beads to mark their history. I looked at the photos of the beads and thought “they’re so pretty. They’re just like mine.” And like that, I made the connection. I contacted the Child Cancer Foundation and asked if they would like to have my beads. They were so excited! They’d love to have them, we just had to get them to Auckland. Could I post them? they asked. No. No I cannot. There are lots. No. No you cannot. There are LOTS. Sorted out ready for packing. I couldn’t get them all in a close shot. Still haven’t figured out how many there are? Eventually we agreed that we’d wait until Mechanic Man was heading north and load them into the van for him to drop off. It took a couple of months but eventually he was ready for a trip north. I hauled all the beads out and tried to figure out how to pack them in a way that was transportable and could be carried by one person, and as I did so I decided to do a quick bit of maths. 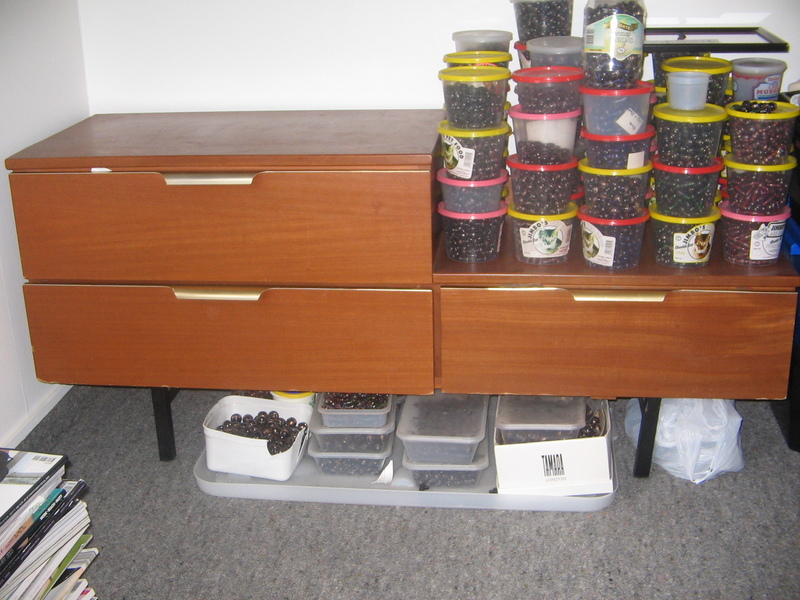 Based on the average weight of the bead, and estimating the number of beads in each container, I worked out I had 10,000 to 12,000 beads, weighing about 70 kilograms and taking up over a cubic metre of space. That, people, is the very essence of a LOT of beads. Mechanic Man dropped them off to the Child Cancer Foundation, who has arranged an army of volunteers to clean all the holes and anneal the beads to make them safe for children and their families. The people there were so excited, I wish I could have been there to see it! I asked Mechanic Man to take a photo with this post in mind, but he’s not that way inclined and forgot. So you’ll just have to imagine it. 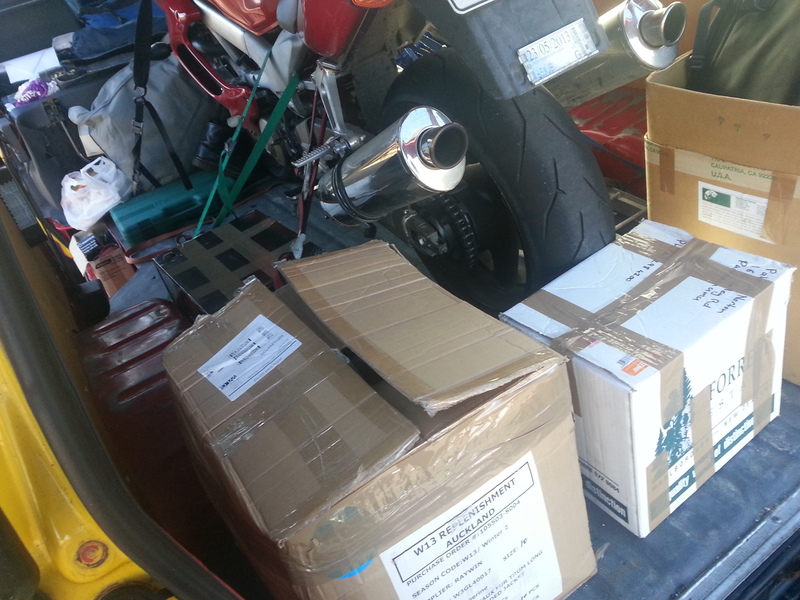 It’s hard to tell, but the three large cardboard boxes stacked around the motorbike? They’re ALL BEADS. So I have divested myself of 12,000 beads. 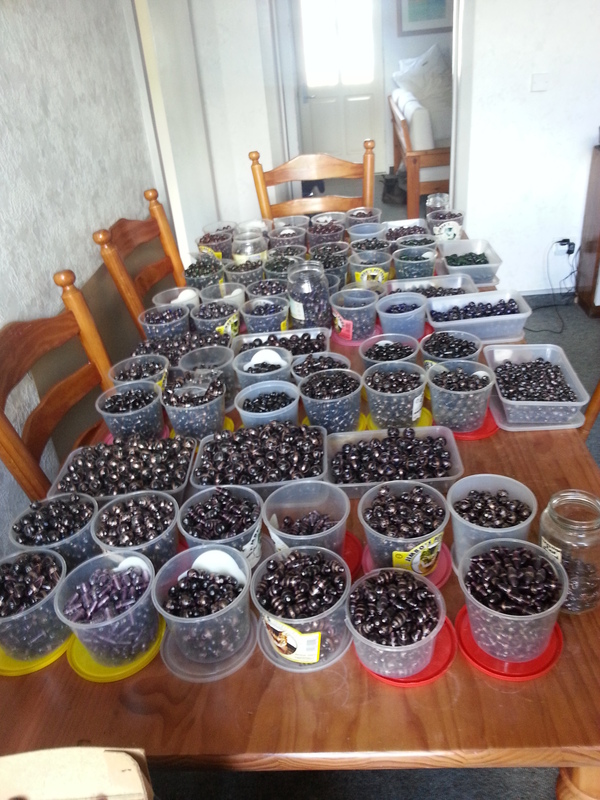 Of 70 kilos of beads. Of over 1 cubic metre of beads. So after 14 years, I created physical space in my home, mental space in my creative juices, and made a bunch of people very happy. It’s one of the most satisfying things I’ve ever done with jewellery. And to top it off, I got a Christmas card from them saying that they’d been giving the beads away to parents and siblings of their child cancer clients, who were making their own necklaces, or earrings, or even Christmas decorations out of them. I did keep one bead of every design, for sentimental reasons, of course! Now don’t get me wrong – these weren’t the ONLY beads I got that fun day 14 years ago. I’ve kept all the others, so I can still continue to create jewellery, but the ones I’ve got left take up much less space and remain exciting to work with. But clearing out those beads? That was truly a moment of satisfaction! Do y’all remember Sew Bossy? It was created by Closet Case Files and Oonaballoona waaaay back in March 2013. The idea is you pair up with someone and each of you picks a project for the other and provides all the gubbins you need to make it happen. It’s a great way to try something you might not have done otherwise. Well, I thought it was a cool idea, but I didn’t go looking for someone cos I am always busy! But then I got an email from the fun and fabulous Kat of Modern Vintage Cupcakes asking me if I wanted to partner with her. And how could I say no to that awesomeness? Especially when she mentioned that Oonaballona herself had suggested the match – I just about popped. Oona had heard of me? Holyfreakingmoly! We agreed a few constraints (neither of us wanted to have to make trousers; Kat needed baby-feeding suitable top half; we wanted natural fibres if at all possible; and we agreed a budget) and then got to planning. Shortly afterwards, Kat gave me my kit, all bagged up and ready to roll. It included the the Cake Hummingbird pattern; a merino/nylon blend with a textured stripe in raspberry (for the top); a stable woven purple and black houndstooth in uncertain fibres that I think are largely cotton (for the skirt); skirt lining in navy blue; pink lace for the skirt hem; and a trouser bar and hook for the skirt. I LOVE peplums (even before they were cool) and skirt flounces (so much!) and raspberry and houndstooth so this was an exciting combo for me! But, as is always the case, I’m so freaking busy that it sat for ages. But finally, in November, I decided to knock out the top. It was a simple knit design, and Cake was supposed to be this super easy successful fitting thingy, right? I decided to go in cold, no mock-up, use the fabric Kat gave me, and follow Cake’s instructions throughout to see how fabulous and revolutionary the patterns were. But it wasn’t the cakewalk I expected. (Like what I did there? Hehe). Firstly, there were 2 or 3 errata in the pattern which caused me a bit of grief until I figured them out, the worst being the neckband needing to be cut on the fold – but there being no foldline marked on the tissue, and the instructions to cut on the fold in the layout info were a bit hidden away. Of course, I figured this out because the first neckband I cut didn’t fit! But once I got past those minor issues, I sewed it up. It went together well and quickly. But the pattern for the top explained to use your size according to the chart for a standard fit, up a size for a relaxed fit, and down a size for a firm fit. I didn’t want to be stuffed into this thing, so decided to go for a standard fit. And it came out HUGE on me. But, maybe we just have a different interpretation of standard fit for a knit top? 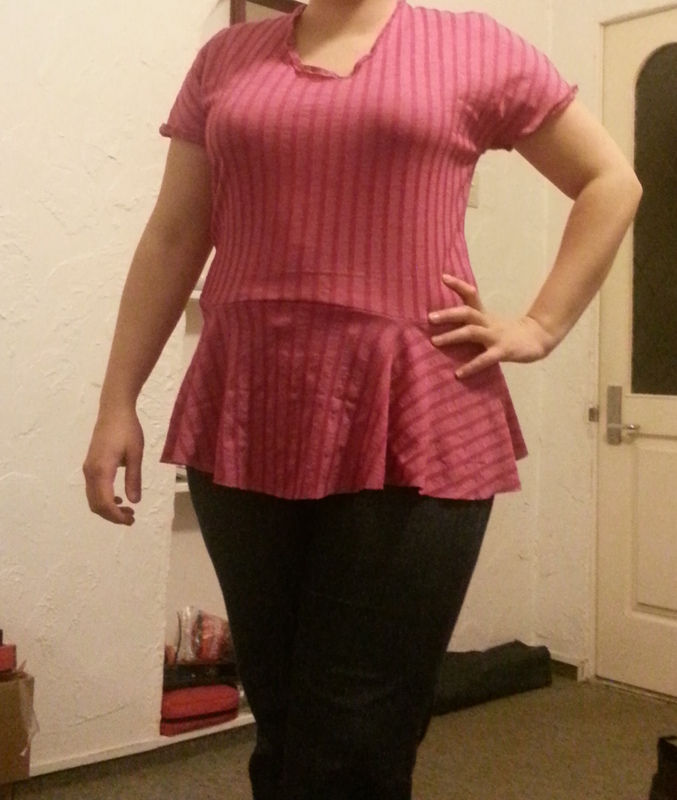 And the peplum was completely in the wrong place, far too low! But maybe I just measured my length wrong for that one though. And I hated the neckline and wasn’t sure about the length of the sleeves, but that’s definitely just personal aesthetics. Oh it’s awful, why am I putting this on the internet!!! So with all of those things annoying me I shoved it into the naughty corner for a month. I finally took it out to remake it on my Christmas break. At which point I mostly abandoned the pattern and winged it. Firstly, I decided to unpick the peplum so I didn’t have to cut a new one. But lightning stitch, the one recommended by the pattern, can NOT be unpicked. I must have spent well over 3 hours working on it and managed to unpick less than a quarter, and was tearing holes in it as I went. So I gave up and cut the peplum off entirely. I used a bit of ribbon tied over the top to find my new waistline, and cut to suit. Then Mama Magpie pinned in new side seams (which extend to under the arm, to make the sleeves snugger) and I sewed them in place. Because of the impossibility of unpicking the sideseams, I did the sideseam alteration without unpicking it and reapplying the band in the flat, so after putting the new seams in I chopped off the grotty bands and had to re-apply them in the round, and had to figure out the length myself (as I’d changed the size by taking in the sleeve). I did the first one by eyeballing it as I sewed, and then cut the second one to match, I thought. But I cocked it up so it was a different size and was visibly looser than the first one. After some tears, Mama Magpie chopped off THOSE bands and redid them both for me. Thanks Mama! And as a bonus I much prefer this sleeve length! We fixed the neckline by the simple method of pinning where we thought it should be and cutting it. Similarly to the sleeves, I had to reapply the neckline band in the round but at least I didn’t have to make two matching ones so eyeballing it worked. I then recut the peplum but forgot to account for the smaller sideseams and cut the same sized waist hole as I had for the first version. I “fixed” this by stretching the top slightly as I added the peplum, but it leaves the seam a little bit rippled. Luckily, I much prefer the top styled with a belt, which hides that sin. Basically, if I was ever to remake this pattern, I’d have to make a completely different size to the one I started with, and I’d still alter the neckline. So, at this point I’m undecided about its place in the make-again pile. Proof the wind was real. This photo isn’t staged, I really pull that face! But enlivened by my semi-success, I decided to plunge on with the skirt. I always start with separating the pieces from each other and making a pile of the ones I’m using in my make. As I did so I discovered pattern piece J was missing! I tore the house apart, thinking I’d thrown it out or lost or moved the piece, but to no avail. I considered asking one of the WSBN girls to borrow their pattern, but luckily discovered on the web (while looking something else up) that the missing piece was a production issue and if you ask nicely, Cake will send you the missing piece. A download is also available but I didn’t want to tape it together so I filled in the request for the paper piece and waited. Unfortunately, Steph, the woman behind Cake, was ill and it was about a month before she was able to reply and send out the piece. So the project languished once more. The piece finally arrived, and after a couple of very busy weeks I cracked into the pattern. Again, it sewed up nice and quickly and the pocket bags are made in a cool way. But… it was beyond too big. It was HUGE. ARGH! Excuse the lousy selfie, but look at that size difference! Again, I’d decided to plunge in, no mock-up, following Cake’s instructions. The pattern goes up in 5 inch increments for the hip, and the pattern suggests if you are between sizes, to cut the next size up and then take it in in the “mid-construction fitting step”. The sizes available were a 45 and 50 and I have a 46inch hip, so duly cut the 50. What I didn’t check (and I normally do) was what the FINISHED measurements of the garment were. If I had done so, I would have discovered this skirt is drafted with about 3inches of wearing ease, which is much more than I like, and would have realised that a 48inch finished measurement was about right. As it was, the 53inch skirt literally fell off me. It went back into the naughty corner while I fumed at the frustration of it all. As eluded to briefly last post, I’ve been having a low-jo time of late, and getting this skirt out was a bit of a drought breaker. The disastrous result sent me back into why-am-I-even-bothering mode for a while. But my amazing sewing friends came to the rescue. I vented to the WSBN group who were uniformly encouraging and understanding, and then my friend the fabulous Sarah agreed to pin the side seams in. The amount to come off was so dramatic we also decided to take a bit out of the top of darts at the back and the panel seams at the front. There’s a darts-worth of shaping in each front panel seam, so this alteration was just taken out at the top then tapered into the straight seam. By the time we’d finished the alterations it was still a bit looser than I normally wear in a straight skirt, but I was worried about how it would look it I took more off the sideseams without altering the size of the centre front panel so I decided that it was just a bit more wearing ease and I’d cope. Part of my challenge from Kat was to insert a lining, which was easy. Kat has written a great tutorial here, but I did it slightly differently. Rather than sew a dart into the lining, I put a pleat in. And because I’d cut the lining before altering the side seams and “darts” of the skirt, I eyeballed the pleat by inserting the lining into the skirt, sewing it to the invisible zip tape, matching and pinning the sideseams and centre front, and then pleating out the excess in the lining so that it fitted. Easy! Thankfully. I followed the instructions for the waistband and found another issue with the pattern, one of the most significant in my opinion. The pattern calls for the waistband to be sewn in using stitch-in-the-ditch. Cake has put a lot of effort into beginner-friendly-ising their patterns, with clever and cool use of icons and clear explanations. But the instruction to “add waistband using stitch in the ditch” wasn’t explained at all. With the years of exposure to sewing I’ve had, I’d heard of the technique, but it had been a long time so I Googled it to make sure I remembered it correctly. It’s a technique that requires absolute precision in ironing, pining, and sewing, and mistakes are obvious. I am surprised that this would be included in a beginner pattern, and especially without instruction or reference! Normally I slipstitch my waistbands in place, but I thought I’d try the stitch-in-the-ditch to see how it went. As my first attempt, it’s pretty lacklustre. I struggled to get the stitches perfectly in the ditch, and it only requires the slightest deviation from the stitching line to make it ugly. The underside of the band wasn’t perfectly parallel with the stitching, resulting in an effective but unattractive inside. I’ve since figured out I used a stitch length that was probably too long, and I will try the technique again, but after trying it out I was baffled as to why it was so causally slipped into the pattern and wondered how many truly beginner sewers have had issues with this when they came across it. Pocketses! With the amount that came off the side seams, this should have hade a slider smaller centre panel and therefore slighter wider pockets, but they actually still work. But once the waistband was on I was hitting the home stretch. But I was running out of time before our photo date, and at this stage it is still unhemmed and without the flounce inserted in the lining! 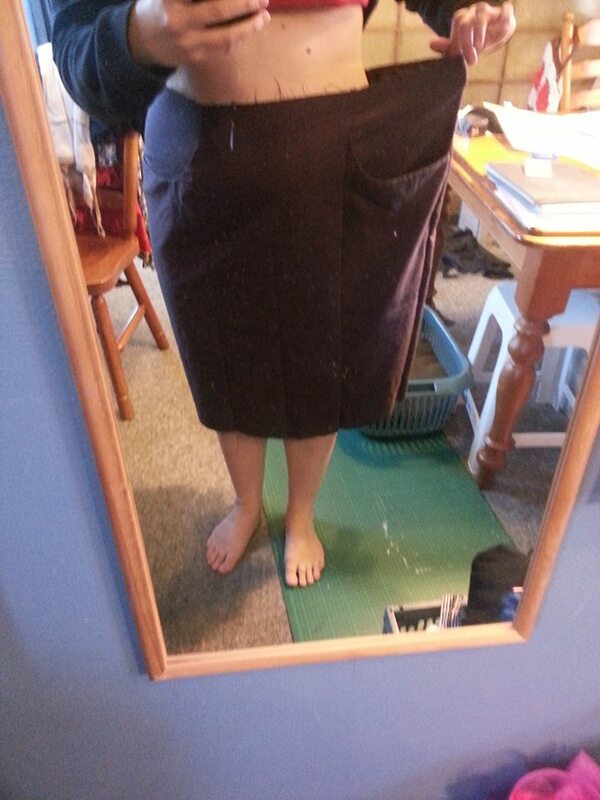 (Which I might not do, as a friend suggested slipstitching the lining to the flounce seam on the skirt instead). But on the day it was close enough to finished to catch up with Kat (and Drake!) and take these photos in a little park in Newtown that we walked to from Kat’s place. But I decided, while wearing the skirt for the day with Kat, that the additional wearing ease is driving me crazy and I hate it and I need to take it in more. I was devastated at the thought of taking the waistband off, but Kat has pointed out that there’s no reason I can’t have side seams in my waistband, so I’ll eventually unpick the waistband just at each side-seam and take out more from the skirt. And finish the lining. And hem it. And add the lace. And THEN I’ll wear it. Promise. All up, the experience with Cake was… interesting. Some really clever ideas, but little annoying niggles too. 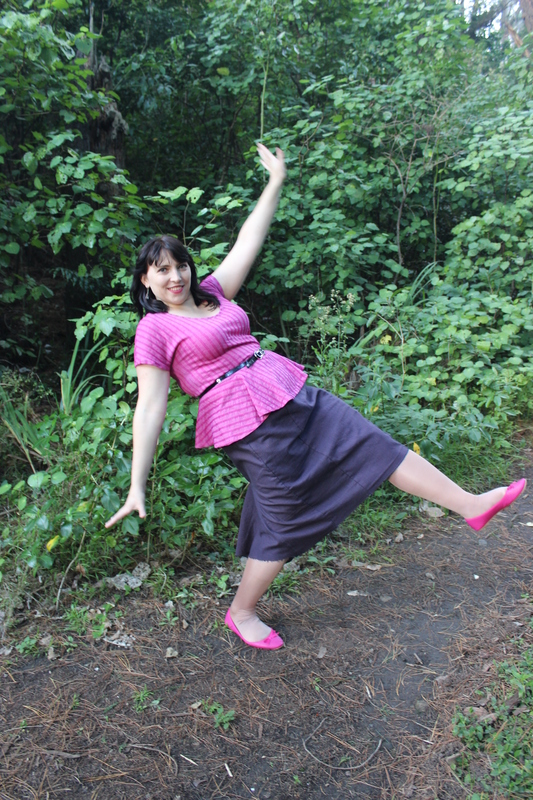 But, I would make the skirt again – and make the 45inch hip as my starting size! This is just for your entertainment! As for what I got for Kat… around the time we agreed to this crazy game, Kat posted about her trip to Wellington Fashion Week. She mentioned that she liked the fitted and flared silhouette, and also that she was really taken by the colour blocked pink and yellow, and pink and orange combinations but didn’t tend to colour block, so that’s what I decided to use as inspiration for her kit. She also mentioned how much she liked zip-front tops so I decided that had to happen too. Unfortunately by looking only for pink and yellow or pink and orange combinations, my options were limited, so I didn’t get anything as suitable for a flared floaty skirt as I wanted. But I did find this absolutely beautiful pink micro-cord, and some orange cotton sateen and decided to work around that. I used MrsC as my personal spy to pick out buttons that Kat had been eyeing up in Made Marion, and decided that the zip needed to be pink to match the skirt. I hunted forever to find the zip, and despite my preference to shop local eventually had to use eBay. I loaned Kat patterns from my stash as I couldn’t find anything new that perfectly matched my vision. The skirt in particularly is special: it’s from a Burda magazine pattern, and the one that started my addiction to Burda mags. Mama Magpie gave me the magazine years ago and I fell in love with this skirt. But I’ve never made it. And I don’t care now that I didn’t get the original vision of a floaty skirt. Because I think this pink skirt looks SMOKING HOT on Kat in a jaw-hitting-the-ground kind of way. Smoking. Foxy. Stunning. Gorgeous. Take your pick. So, hopefully she won’t mind that I bought some of the same pink cord for me… and might make the exact same skirt from it! It’s about time I made that pattern! Go check her post out here! 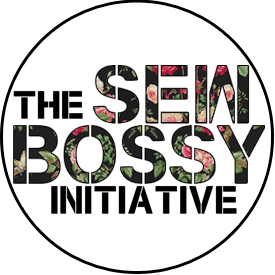 Sew Bossy breathed some interest and fun into my sewing. I wouldn’t have picked out either of these fabrics myself, but the colours and patterns are fabulous and I’m enjoying having them in my wardrobe. And I enjoyed seeing someone else produce my vision for them. 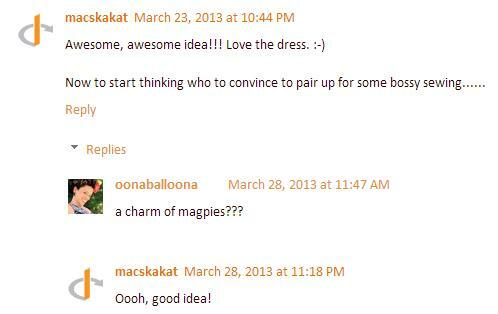 I suggest you find a buddy and organise a Sew Bossy swap of your own, even if you don’t blog. It’s great fun!